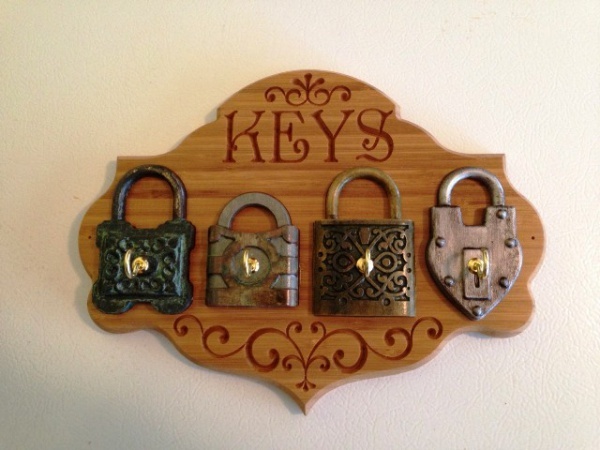 This project features four padlock models finished to look like aged metal, then incorporated with a wooden plaque as a truly unique and convenient wall-mounted key hanger for you to enjoy. The padlocks were created in Aspire using reference photos of actual antique padlocks as guides during the modeling process. The padlocks are machined separately from the plaque and are inserted as onlays into shallow pockets for precise positioning on the plaque. Thanks to the software's handy “InlayToolpath” feature, the padlock cutouts and corresponding receiving pockets are automatically adjusted to for bit diameters and yield a perfect fit. Beautiful work! Very realistic padlocks! Do you recall what font you used for this project? The font is called PensHurst. scubanimal wrote: Thank you Mike !! Very cool! Thanks mike, fun project! Thank you! It was fun for me too!